God is saying that He wants to give you a media strategy for the nations that is actually going to be a recording mechanism that can fill households faster through media than they would ever hear it through the written word. I saw Him giving you several people who will be media based who would be able to spread the good news of what's happening. I felt like He was saying "I want to align whatever you are doing with media right now to be a source of good stories and good news." It reminded me of Bethel where they are doing those little videos of people's testimonies and they are being shared like 10,000 times. I feel like the Lord is saying "I have a sharing mechanism through the internet for your media that will blow you away..."
...I feel like the Lord is saying, "I am giving you the mountain of media and I am setting up the structure you are already working on to create a voice that will go further", and I saw the more creation you've had for 17 years being dwarfed by the multiplication you will have over the next 5 to 10 years. I feel like the Lord is saying "It is actually like an accelerator to where you will be shocked at the growth." I know you have done media stuff, so I'm not sure what the key is, but I know God will give you the word of wisdom that will unlock the key to this successful growth plan and connection plan because I kept hearing the word Connection! Connection! Connection! To where everybody would feel connected together as if they were watching the same thing, doing the same thing from all these locations in the same week. They would feel connected to each other's stories and what is going on. I felt like it was popcorn. It was't just the media you were producing but the media that was being produced in other places. I felt like the Lord said it was like this channel of communication of the goodness of God through the miraculous power that would begin to populate some sort of channel where people with all kinds of diseases would have role models of healing that they could look at and they are already there, but there is a media platform that God is saying "I want to release" that will create one of the biggest places and containers of faith we've had in this generation. So He is going to give you some key people who will help bring this about. But this IS going to unlock your next stage. Media will unlock your next stage. Media will unlock your next stage of not only growth but momentum. After I heard this word from God, I thought this is one of the most important things for the Healing Rooms' contribution to the world. You are going to give us faith for the amount of storage we are going to be able to hear of cancers healed from the word of their testimony in front of our eyes - on our computers, on our smart phones, on our devices. There will be no end. We will start to think of some things as lesser than healings because of the recording mechanism that will come out from you guys. It will create a momentum in the healing movement like we've never seen before. And you guys the Lord is asking you to carry that torch. I actually saw an angel that looked like a lampstand. It was keeping a fire before the throne of the testimony of God. I feel like this isn't just an assignment, but there is heavenly power, there is resource to make this happen. You are going to start to attract some people who work in the media field who will take it to different levels as you go. You just have to bite off the piece you can chew now, and God will multiply it. Shawn Bolz. 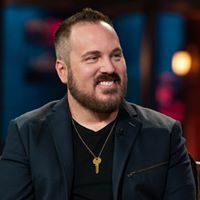 Shawn Bolz is a prophetic minister whose passion is to influence Christians to take on their journey of intimacy with God wholeheartedly. He has used his prophetic ministry and his fresh Biblical perspective in his teaching/life coaching messages to help people come into a relational approach with God that is both organic and revelatory.